The Foundation provides grants to primarily offset food insecurity and make items available that are specific to Senior needs. The Lincoln Hills Foundation has distributed $15,000 in grants to the Salt Mine to serve those seniors in need in the Lincoln area. Photo taken today at Bob Free’s presentation of $5,000 to the Salt Mine. On the left is Eric Long, the Salt Mine Treasurer/Administrator, and on the right is his son Blake. 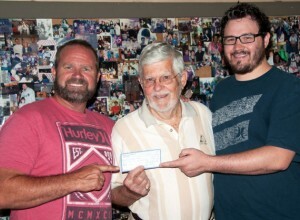 Gerald Johnson (center), Foundation President, hands Father Eric Long (left) of The Salt Mine a grant check of $5,000 while Blake Long (right) looks on. For 2015, The Lincoln Hills Foundation has distributed $10,000 in grants to The Salt Mine to serve those seniors in need in the Lincoln area.